What is particle surface area? In the world of colloids, particle surface area is the property of colloidal silver that directly determines the ability of the colloid to react with its environment. Therefore the effectiveness of colloidal silver is predicated on particle surface area. The higher the particle surface area the more effective the colloidal silver. Particle surface area is defined as the total surface area in square centimeters (cm2) of all the particles in one milliliter (mL) of colloid. In the world of chemistry the ability of one substance to interact with other substances in its environment is predicated on the surface area of the substances or stated another way, reactivity increases with increasing surface area. A larger value of particle surface area increases the reactivity of the colloid. In the booklet "Silver Colloids" Professor Gibbs wrote "The size of the particles in the colloidal silver suspensions we use for health purposes is very important. Particle size controls the surface area and therefore the effectiveness of the colloidal silver suspension." For this reason particle surface area is the single most important property of colloidal silver. It is not uncommon for non-technical readers to mistakenly believe that the concentration (ppm) of silver is the most important property. Companies selling silver protein type products will advertise very high values of silver concentration with the explanation that higher ppm concentrations are more effective but that is simply not true. In fact silver protein products have very low values of particle surface area owing to the very large size particles present in those products. For a complete discussion on silver protein products read The Truth About Silver Protein Products. Colloid particle surface area increases as the concentration of metal particles increases. Colloids that have the highest percentage of their metal content in the form of nanoparticles will have the highest particle surface area. Therefore, colloids that are mostly ionic silver will have a low particle surface area since most of the metal content is in the form of metal ions not nanoparticles. For a more detailed discussion of ionic silver see: What is Ionic Silver? Colloid particle surface area increases as the particle size decreases. The highest particle surface area is achieved when there is a high concentration of nanometer or sub-nanometer sized particles. While this is the desired result, it is also the most difficult to achieve. Colloids containing high concentrations of large particles as found in silver protein products will have low particle surface area. Ratio of surface area to mass is an expression of how efficiently a given mass of silver (concentration) is able to provide particle surface area. This ratio is calculated by dividing the particle surface area (sq. cm) by the mass (mg/L). For Mesosilver this value would be 5.23 (104.7/20). The higher this value is the more efficiently the silver is being utilized to increase the particle surface area (effectiveness) of the colloid. To put this value in perspective, a typical ionic silver product has a surface area to mass ratio of about 0.021 and a typical silver protein product has a ratio of about 0.024. The ratio for Mesosilver over 200 times greater than either of these product types. In fact no other colloidal silver product has a surface area to mass ratio that even comes close to Mesosilver. A more technical discussion on particle surface is found here. It is the combination of small particle size and high particle concentration that produces the high particle surface area and high bioavailability for maximum effectiveness in a colloidal silver product. The only product offering this powerful combination of properties is Mesosilver. By taking orally (drinking) the silver colloid enters the stomach and then the small intestines. Most of the absorption of the silver particles takes place in the small intestines. The silver particles pass through the lining the small intestines directly into the bloodstream where they circulate to all parts of the body. The particles are eventually removed from the bloodstream by the kidneys and are passed out of the body as waste. See In the bloodstream for more details. The effectiveness of silver particles that circulate in the bloodstream is to a large extent determined by the particle surface area that is available. High particle surface area colloids have most of their silver content contained in the silver particles. The high concentration of particles is in the form of nanometer sized silver particles which presents the highest surface area to the environment in which the colloid is present. 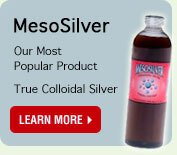 Mesosilver combines the smallest nanometer size particles and the highest particle concentration, a powerful combination of properties, to produce a colloidal silver product that has the highest particle surface area of any colloidal silver product ever tested. The Comparison Table shows how the particle surface area of Mesosilver compares to other products.